Watching top athletes making their job look easy can be incredibly misleading. The top end product tells only a snippet of the real story. Mastering any skill takes a very long time, and it is important to appreciate this when training your own horses. Let us look for a minute at the fastest man in the world, Usain Bolt. He makes running 100m in sub 10 seconds look like a walk in the park. What we see is him running 100m in under 10 seconds. What we don’t see is how he has made that possible. It is the same with the top equestrians. We see the end product and marvel at their skill. What we don’t see is how they made it happen. We are only really seeing horse and rider combinations when they have reached the top of their game, therefore it is hard to imagine the road they have taken to get there. We seem to think they have been waved with a fairy godmother wand which has catapulted them ‘overnight’ to great success. Unfortunately, unless you are successful at winning lotto, there is no such thing as an overnight success, and it is imperative to the welfare of our horses that we remember what success is built upon. It is so important to remember that away from the bright lights and trophies, the normal, day to day training takes place which is actually reasonably unremarkable in its execution. Usain Bolt doesn’t run 100m that fast every day! Just like Valegro doesn’t train at competition Grand Prix level every day. Eventers don’t jump 4 star cross country courses every day and tennis players don’t play Grand Slam Final level tennis every day! They have had to invest in hours and hours of strength, flexibility and control training before mastering and fine tuning their skill and technique. When it comes to your own horse, it is essential to remember what you are achieving every day at home. Every horse requires strengthening and skill/technique training. Just like every rider. This happens through methodical, slow, thoughtful steps. It is not having the horse in a competition frame every day, or allowing it to fire around the arena moving to its maximum ability every day. It must be allowed the time to build the framework/scaffolding required that will give him the base for building muscular strength. He must have the time to build and develop control over his body so that he gains confidence in his work, and avoids injury. This is done by slow, small, unremarkable steps. If I asked you to make big movements or run really fast without any preparation, how much control over your body do you think you would have? How likely are you to injure yourself when you move your body without control? But if I asked you to move with thought for each step, make the steps smaller, the body control rises and the risk of injury dramatically reduces. As a write this I am thinking of young, talented horses as I think their bodies are the most vulnerable. When the joints have an exaggerated movement and the limbs are moved extravagantly, we see it as a talented horse that is more evolved and capable. The mistake that can happen is that there is a subconscious expectation that the horse knows its job already and is ready to perform. The assumption tends to be that the hard work is done for us, movement that can be created by good training and strength in a lesser moving horse is naturally there, and the danger is that the base of support, the infrastructure and the ability to control the body, is not developed. In order to minimize the risk of injury, the horse must be strengthened from the inside out. This is done by controlled movement of the joints and placement of the limbs. Applying controlled amounts of load, with a controlled direction of load will enable the soft tissue support system to develop the strength it requires to stabilize the joints. Once the joints are stable, the muscular system can be strengthened and the skill and technique for the job at hand can start to be taught. It all starts with the foundations, and for the horse this is the infrastructure around the joints. Get this system strong and balanced and then build on top of that. Trying to build heavy, bulky muscle on top of weak joints is a recipe for disaster. The only way your horse will be comfortable and confident in his work is if you create the base of support that he needs. Once your horse is able to do the work you are asking, only then will he be a happy athlete. Debbie Biles founded db Muscle Therapy in 2009 and since then has operated successful practices in the UK and New Zealand. With a strong practical and academic equestrian background, Debbie draws from a comprehensive skill set to bring clients practical solutions based on sound, scientific principles. Debbie holds a BSc (Equine), BHSAI, Diplomas in Human Personal Training and Sports Therapy and Equine Sports Therapy, all gained in the UK. Debbie has been a rider with Dressage Grand Prix trainers in the UK and America, and has spent some time riding in Germany. 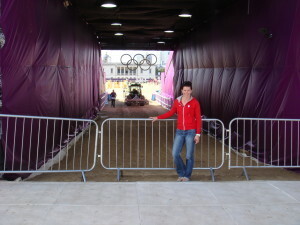 Debbie has worked as soft tissue therapist at the London Olympics 2012, and as Team Therapist for the NZ Para-Olympic Team at London 2012 and the World Equestrian Games 2014 in Normandy. Debbie currently works in NZ, with regular trips to clients in Germany and the UK.